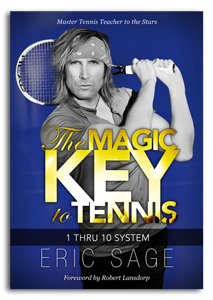 Eric conducts a productive, exciting seminar relating to his revolutionary 1 Thru 10 System. This includes modern tennis techniques, mental toughness, shot selection, and beyond. Eric gets interactive with the audience as he brings audience members up on stage and helps to improve their games on the spot. This package also includes an open question and answer session, a meet & greet, and book signing at the conclusion of the event. Live music performance with Eric singing can also be added.